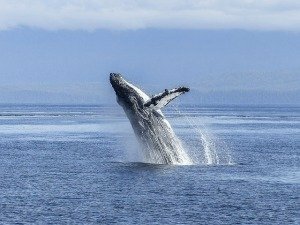 There are so many places and things to see and do when on vacation in our area. Here is a list of 10 of our favorite things for you to experience while enjoying your vacation. 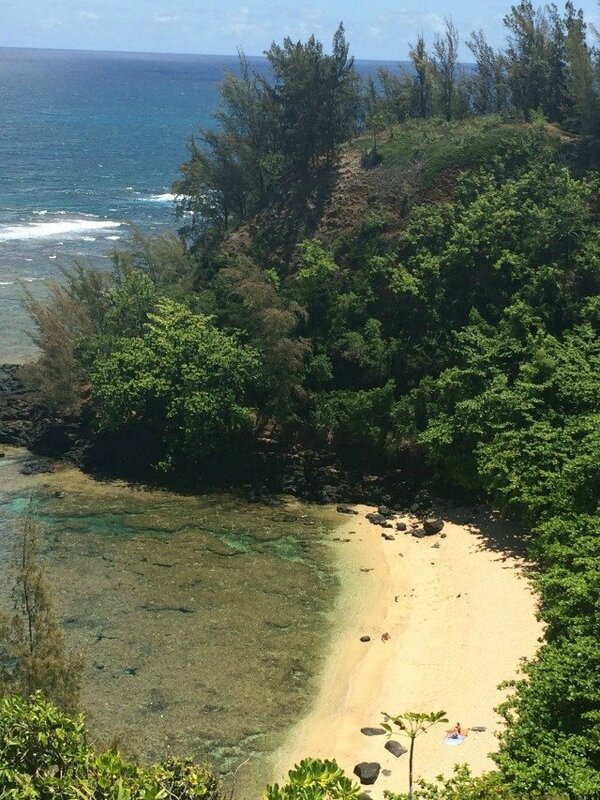 Nestled directly below Honu Point sits this lovely secluded beach. Access is limited so you’ll never find a crowd. The sand is coarse, made up of tiny pieces of shell and coral, and there is plenty of shade. The water is shallow and perfect for snorkeling. Advanced swimmers can swim out to the edge of the reef and possibly see honu (sea turtles) munching on the algae. Less advanced swimmers will enjoy the calm waters over the reef where tropical fish congregate. If there is a very large swell and the waves are huge, mostly during the winter months, walking to this beach, as well as any other beach along the rocky coast, is not recommended. But most of the year it’s idyllic. Directions on how to get to it from Honu Point are written out in the Welcome Notebook. It takes about 15 minutes to walk to it from our home. Queen’s Bath is a salt water pond at the edge of the ocean in Princeville. Just a couple of miles from Honu Point, this natural tub of water is full of tiny fish and the water is super buoyant due to the excessive salt that stays in the pond. To get there drive to Punahele Street in Princeville and park. 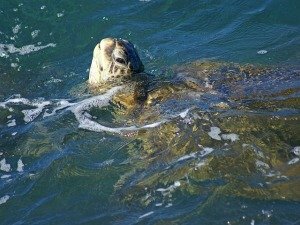 From there take a steep hike down a hill (sometimes slippery if it has been raining), take a left and then walk across black rock where honu (sea turtles) can often be seen eating along the ocean’s edge. Arrive early in the day because the only place to park is a small lot which fills up fast. This is definitely NOT a winter activity. When the waves are high and rough it is VERY dangerous. If the signs are posted indicating the trail is closed, and the gate is locked, DO NOT GO. It takes only one wave to sweep you out to sea. Please be careful. 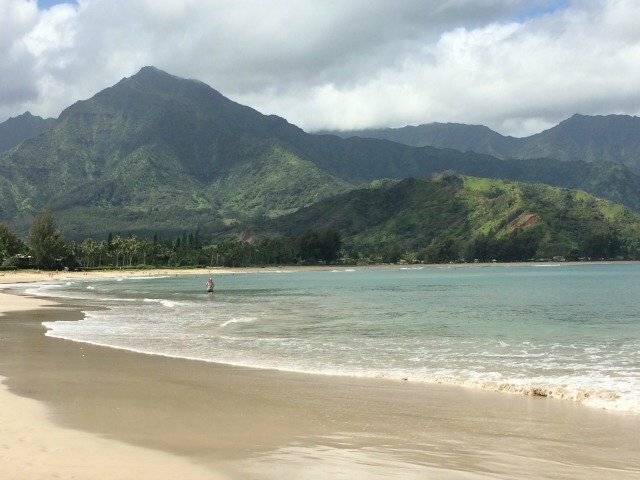 Although there are many, many beaches at which to swim on the North Shore, Kalihiwai Bay is my favorite. Besides being a beautiful spot with waves for boogie boarding at one end and still waters at the other, very few tourists find their way here so you may have the beach mostly to yourself. There is parking just off the sand and lots of ironwood trees for shade. Or, set up your chairs and umbrella closer to the water’s edge. It’s a perfect place to relax with a good book. To get there, head south on the Kuhio Highway, cross the long concrete bridge which towers over Kalihiwai River, turn left on Kalihiwai Road and drive all the way to the end. There is a Kalihiwai Road before the bridge (they used to be connected) which takes you to Anini Beach, another great spot. This spectacular white sand bay is the perfect spot for a walk or a swim and it’s only a ten minute drive down the hill from Honu Point. Because of the lush green mountain backdrop this has to be one of my favorite places on the island. During the summer months boats from around the world anchor offshore. Paddle boarders and kayaks are also seen skimming the calm waters. All year long surfers, experienced or not, catch the waves at some of the best surfing spots in the world. 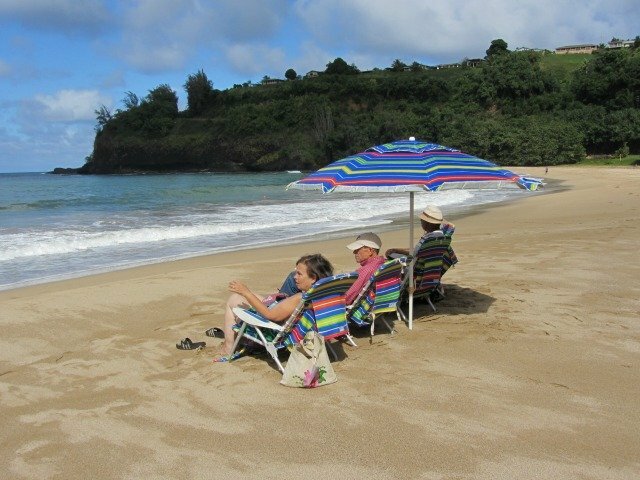 Hanalei town has all the equipment you need to rent in order to enjoy any of these activities. There is a lifeguard station about halfway around the bay. There are picnic tables by the pier which make a great spot for a picnic lunch or dinner as you watch the sun drop into the ocean and the sky light up with pastels. Go north on the Kuhio Highway, cross the Hanalei Bridge and then turn right on Aku Road. Drive to the end of Aku and turn right on Weke Road. The Pavilion is on your left with the lifeguard stand at the edge of the beach. The pier is at the end of Weke Road. Sunrise or sunset from the end of the pier is a never to be forgotten experience. This world famous coastline with majestic cliffs and lush green valleys is so remote it can be seen only by foot, air, or sea. Our favorite is the boat excursion which brings you down the coast, sometimes into caves, and stops for time to snorkel and have lunch. It’s not uncommon to see spinner dolphins along the way. The trips are usually 3 to 4 hours long. There are several different kinds of boats, including zodiacs and catamerans, and they leave either out of Port Allen or Hanalei Bay. One of the companies which departs out of the bay is http://www.napalicatamaran.com/ (see blog under “Our Local Guide” section). 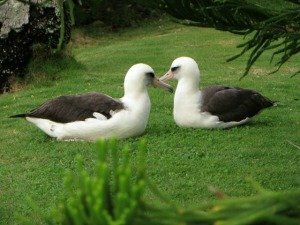 Anaina Hou Community Park is a privately owned property right on the Kuhio Highway, just outside of Kilauea and 5 minutes from Honu Point, which has been opened to the public for various forms of entertainment. The Wai Koa Loop Trail is a 5 mile loop that can be walked or ridden on a bike (bikes are available for rent at the mini golf). About halfway around the loop is the Stone Dam pictured on our Home Page under “Spectacular Beauty.” Pack a picnic lunch and relish it in the well-maintained area next to the Kilauea River. 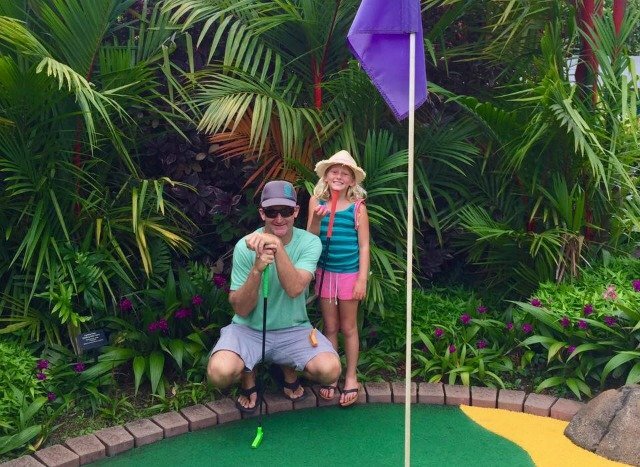 Afterwards stop in for a competitive round of mini golf while being surrounded by a lovely botanical garden. A trip to the Garden Island is not complete unless you visit one of our incredible botanical gardens. Na Aina Kai Gardens, pictured above, has been family created and operated since 1999. It is 240 acres of diverse gardens and horticulture with one of the largest collections of bronze sculptures in the United States. There are walking and riding tours Tuesday through Friday only. 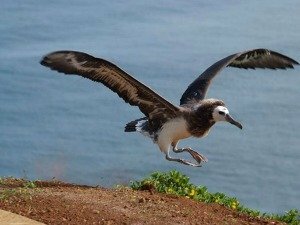 It is on Wailapa Road, 15 minutes from Honu Point. 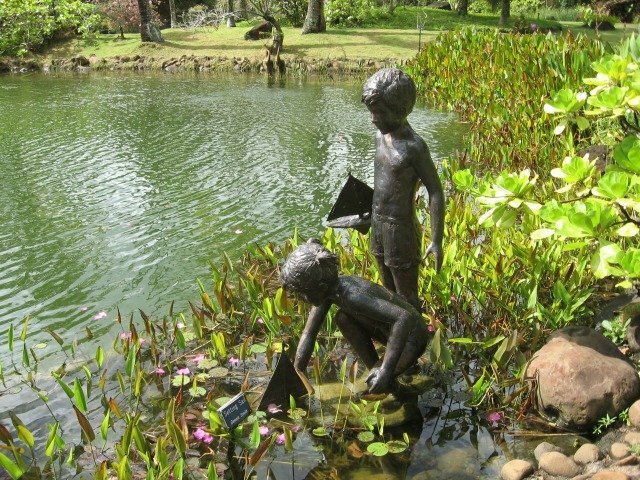 Another garden which is smaller, but just as beautiful, is Princeville Botanical Gardens. This garden offers a unique opportunity to see a family grown and operated botanical garden, complete with exotic flowers, delicious fruit trees, healthy beehives and organic cacao (chocolate) trees. Walking tours are three days a week. It is located on Ahonui Road, just off of Kapaka Road, the first right heading south on Kuhio Highway. A little further away are the three National Tropical Botanical Gardens on Kauai. Limahuli Gardens is on the North Shore while Allerton and McBryde are on the South Shore. All five gardens have unique features which make them all worth visiting. 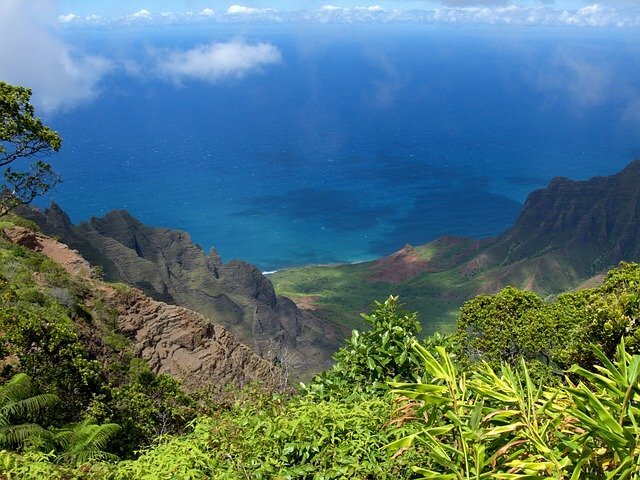 Some of the best hiking trails in Hawaii are on Kauai. From the cool mountains of Koke’e State Park to the rugged coast of the Na Pali, there are trails and paths for every level of endurance. 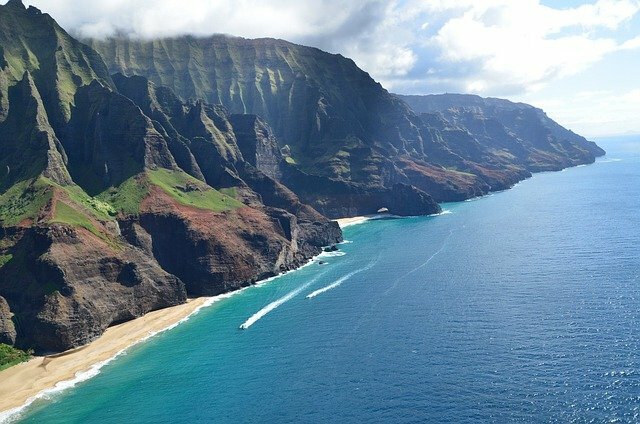 To hike from the end of the road at Ke’e to the Kalalau Valley (pictured above from the lookout at Koke’e) on the Na Pali Coast (11 miles) you must get a permit, but there are many, many incredible day hikes all over the island. The Waimea Canyon, which Mark Twain called, “The Grand Canyon of the Pacific,” is on the drive up to Koke’e. There are several pullouts along the road with expansive views. Driving from Princeville to Koke’e takes about 2 hours so plan to get an early start. If you’re on island for any length of time be sure to stop at one of the island’s farmers markets. You’ll find new and interesting fresh fruits and vegetables along with the standard fare. Papayas, mangos, white pineapples and apple bananas are irresistably good. Crafts made by local artists are also for sale. 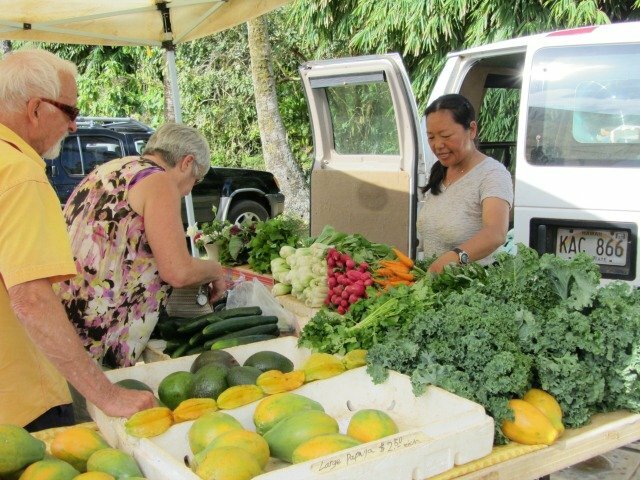 There are markets all over the island, but on the North Shore there are three. On Saturdays the stands are open in Hanalei, close to the green church, at 9:30, or, if you prefer, drive to the Mini Golf property in Kilauea at 9:00. On Tuesdays you can find the vendors in Waipa at 2:00. Waipa is just past the one lane bridge that you cross as you leave Hanalei to the north. Don’t be late! 11. Grab your Computer and Make Arrangements for your Next Trip to Kauai! It was SO difficult narrowing this list down to 10. We feel so grateful to live on this amazing island in the middle of the Pacific Ocean.